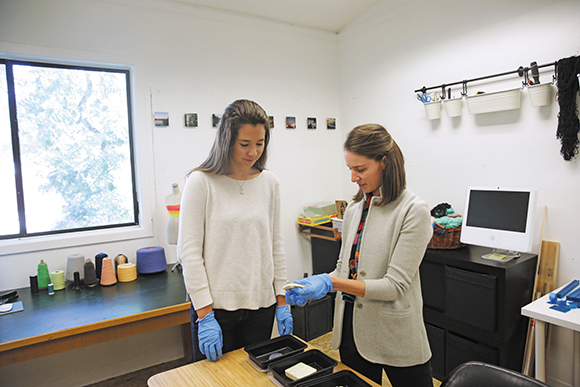 Sarah Hashiguchi first became interested the connection between product design and chemistry when she took CH 114 Green Product Design, a course designed and taught by UO Chemistry and Biochemistry Sr. Instructor Julie Haack. That interest led Sarah, a Clark Honors College student, to pursue a Product Design major with a minor in Chemistry, and for Dr. Haack to help arrange for Sarah to meet with one of the head chemists at Nike to learn more about working in the field. Sarah got an opportunity to put her knowledge into practice when, after Assistant Professor of Product Design Beth Esponnette won a 2016 Faculty Research Award for her proposal to explore chemical-reactive 3-D printing, she hired Sarah to assist her with her research.